7.5 8 8.5 9 9.5 10 10.5 Qty. 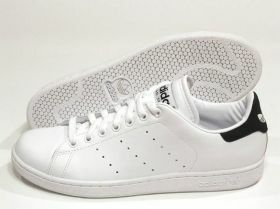 The best selling tennis shoe of all time, endorsed by the tennis legend Stan Smith. Imitated by many but never bettered. The true original. Features a soft glove leather upper, rubber cup outsole and the famous pimple sole. Adidas has a goal: To design shoes that work with the foot, not against it, to help athletes in all sports achieve their highest level of performance. The Stan Smith I Tennis Shoe for Men's lives up to that goal. Usually, adidas shoes have external stripes attached to the shoe. The Stan Smith has no external stripes. Instead, the adidas stripes of are rows of perforations through the leather upper.